Since 2009, Valtim has introduced leading-edge integrated media solutions supporting our clients’ social media presence through software enhancement and investment. Our department that was formerly called “Call Center” has been transformed into a truly integrated Full Service Contact Center, interacting with our clients’ constituents through social media channels to respond to FAQ, promotion, issues-based posts, and more. Inbound and Outbound agents have been seamlessly “blended” into an efficient environment capable of engaging via phone, email, texting, chat and social media interactions. Our digital switching, skills-based routing, and agent optimization are highlights of our Customer Interaction Center, an all-in-one contact center solution: A single application suite, supporting a centralized multichannel platform for unified messaging. Valtim offers AM / PM coverage and state of the art contact center technology which enables close monitoring of contact center performance, call wait times, call handling and call recording. We aim for our operators to be an extension of the organizations of which they serve from within our four walls. To support this goal, we take careful measure to match their skills and interests to those of our clients. We find when using this practice the agent quickly develops a sense of pride and ownership; creating Brand Ambassadors. Across all clients, our contact center currently mans up to 17,000 calls per month – with no limit on the number of incoming lines. We have over 400 toll free numbers at our disposal with approximately 100 in use at any one time. We have a history and track record of meeting standard service levels as well as being able to respond to user dictated quality control benchmarks. Our standard Inbound service level is 80/20 (80% of the calls being answered in 20 seconds or less). In addition, we hold ourselves to less than 5% abandonment rate. Using historical call volumes we are able to forecast staffing to ensure that the SLA’s are met. All calls are managed and monitored to ensure proper call duration and after call work. This ensures the correct staffing is in place and no benchmarks are put in jeopardy. Continued quality assurance reviews with the operators and on-going training ensure the highest rate of engagements and conversions are met. The QC process also ensures the operators are properly satisfying the need of the caller so as to provide the highest “customer service” experience. Currently supporting over 17,000 calls monthly, Valtim’s Call Center is equipped with highly trained call agents who have been with Valtim on average 5 years (excludes part time / seasonal agents). 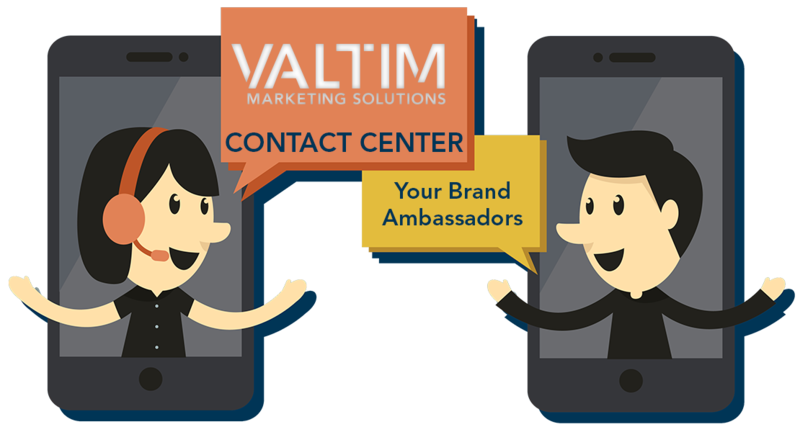 As a fully integrated contact center Valtim can engage with your audience via text message. Sending and receiving both personalized messages, as well as mass communications. Valtim’s email support services allow you to utilize our contact center agents to respond to day-to-day email communications with your members, customers, or prospects. There is a certain portion of your community base that is not comfortable talking one-on-one over the phone. For these individuals, “Chat” provides the perfect vehicle. Chat is a lot less intimidating and gives your customer/member complete control. It is highly important that your company protects its brand by monitoring social media interactions. Valtim provides trained subject-matter-experts (SMEs) that are knowledgeable and can both respond to requests for information and monitor all posts for inappropriate or objectionable content.